When I miss my mom, I want to make her food. 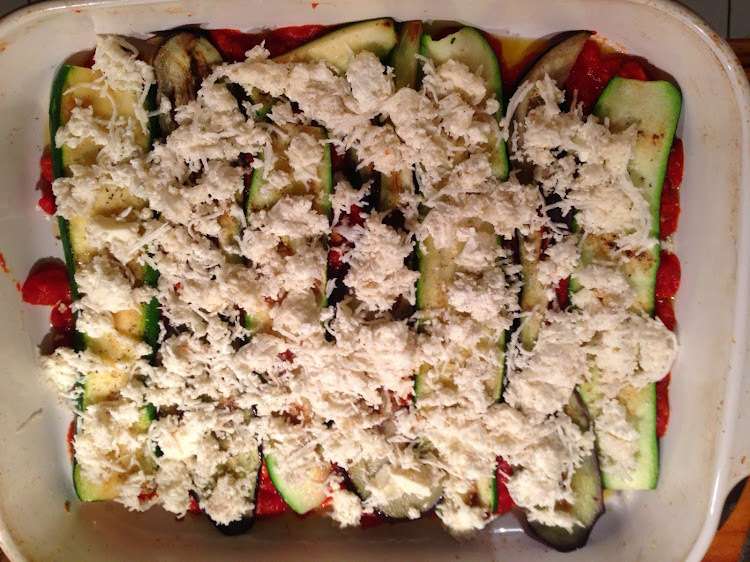 In the summer, when her basil-heady garden is bursting with heirloom, plum and tiger tomatoes, Japanese eggplant and foot long zucchini, my mom makes a delicious, generous, herbaceous Italian bake. It is always loaded with goat cheese, though she is known to blend all kinds of cheeses into it. It has a very rich, deep tomato tasting sauce because of the quality of tomatoes my mom grows. She throws in all kinds of herbs -- Italian basil, Thai basil, purple basil, fresh oregano, sometimes chives. It is a kind of lasagna but without the pasta, leaving the vegetables to take center stage. I love eating it just the way it is, as it is delicious and filling on its own, but for those that want it, go ahead with some whole grain spaghetti! All of the vegetables come from her organic garden and I can tell you that nothing I make here from exported vegetables can compete with those precious home-grown flavors, but it does still taste delicious. What is it about February that makes one long for the summer? I cherish my summer time because I get to go home to my dear family and see some dear friends and my beautiful cat. I miss them all so much, and the sunny warmth and the abundance of the garden. Therefore I decided to make this dish -- it does give me a feeling of home. From a nutritional point of view, this bake is loaded with vegetables, which we all should eat more of, and eating a variety of different vegetables allows for better health. Other than the zucchini, tomatoes and eggplant, I snuck in some carrots and cauliflower, and perhaps you wouldn't notice it even if I asked you to guess. As this is a cheese-heavy dish, I decided to grate in some cauliflower into the cheese so it mimics cheese, and it means you end up using much less cheese than you normally would. This is a plus in my book for numerous reasons - one is that you get to eat more vegetables, two is that it saves calories and three is that you have a better chance for iron absorption if there is less cheese because cheese is rich in calcium, which prevents iron absorption! Even though this dish was originally created to embrace summer vegetables, I enjoy eating it now because it provides the warm comfort of summer. So I hope you enjoy! 1. Make the sauce: Heat oil in a heavy bottom pan and add garlic, oregano and chili flakes, watching not to burn the garlic. After about 10 seconds, add the tomatoes, tomato paste and salt. Simmer on high heat for 20-30 minutes or until the tomato juice evaporates and it's a thick rich sauce. Add the grated carrot towards the end. 2. Slice eggplant and zucchini lengthways, 1/4 inch thick. Season with salt, pepper and oregano. Pan fry in canola oil on high until the zucchini is wilted and the eggplant is tender. (Zucchini needs less cooking time than eggplant). 3. Finely grate the cauliflower in food processor. Mix into a bowl along with goat cheese and Parmesan, nutmeg, salt, pepper. 4. Assembly: First grease a large baking dish with olive oil, then add half the sauce with lots of fresh basil, then layer zucchini and eggplant. Then add half the cheese layer, then the zucchini/eggplant, then the rest of the sauce with fresh basil, then the last of the zucchini and eggplant, and then the last of the cheese mixture and then finally top with sliced mozzarella. 5. Bake at 200C or 425F for 20-25 min or until golden and bubbly. Garnish with fresh basil on top. Very nice and interesting blog!! will keep updating!